Bristol, VA/TN -- The Tennessee Department of Tourist Development’s (TDTD) Born in Bristol, a 53-minute documentary profiling the 2015 recording of Orthophonic Joy: The 1927 Bristol Sessions Revisited, produced in partnership with the Virginia Tourism Corporation, earned shortlist honors at the 63rd Annual Cannes Lion International Festival of Creativity in Cannes, France in the category of Film Craft – Use of Licensed or Adapted Music. The shortlist is a list of candidates that have been selected for final consideration at the festival; Born in Bristol was one of only 216 out of 2,328 entries to earn that distinction. Bristol, VA/TN -- Bristol Ballet, in cooperation with the Birthplace of Country Music (BCM), presents Unbroken Circle—Bristol’s Music in Motion at the Paramount Center for the Arts on April 11 at 7:30 p.m. and April 12 at 2:30 p.m. Unbroken Circle—Bristol’s Music in Motion challenges the imagination through the lyrical poetry of our region’s music and the ethereal beauty of classical dance. The imaginative combination of ballet with the music of the Bristol Sessions, and beyond, honors Bristol’s music legacy with innovation and originality by marrying two forms of creative expression in an unexpected way. Nashville, TN -- Ralph Peer: Record Man, an intimate exhibit at the Country Music Hall of Fame® and Museum, will be unveiled today, September 12. He hailed from Independence, Missouri, but the mark Ralph S. Peer left on popular music spread across the globe. He was a pioneer in recording, music publishing and artist management. He was, in all capacities, a record man. In 1927, Ralph S. Peer went to Bristol, TN/VA with his recording gear. Little did he know what the impact of that journey would become. He captured the local artists on his recording equipment and then released them on records for radio and purchase. The Bristol Sessions, as they have become known, resulted in the biggest explosion of music that we call "The Big Bang of Country Music." It was a bang heard coast to coast through radio and, it was a hit. However, it didn't stop there. The following year, "The Johnson City Sessions" were recorded. Johnson City is just south west of Bristol. Now, a new piece is coming together. The dream that began years ago is finally on the horizon. The Birthplace of Country Music's museum is scheduled to open August 1, 2014 in Bristol TN/VA. 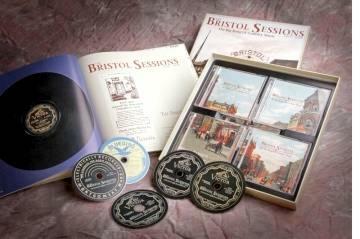 Referred to as the "big bang of country music," the 1927 Bristol Sessions changed the industry forever. The Birthplace of Country Music Museum, in affiliation with the Smithsonian Institution, will tell the story of Bristol's musical heritage and its impact on the world.